In the heart of Tearout Fest you’ll find the ruins of the prophecy stage. Where people go to get lost in a trance so that they can find themselves and prepare for the new world that is Tearout fest. Elusive Audio will be teaming up with Legacy technical productions to bring you a huge sound and lighting show. Elusive audio will be bringing their clean yet powerful martin audio and Turbosound system along with them for the journey so that you can your fix of trance, electro and techno. The Wilderness stage is a lost world, People who have been said to go in there never come out!!! 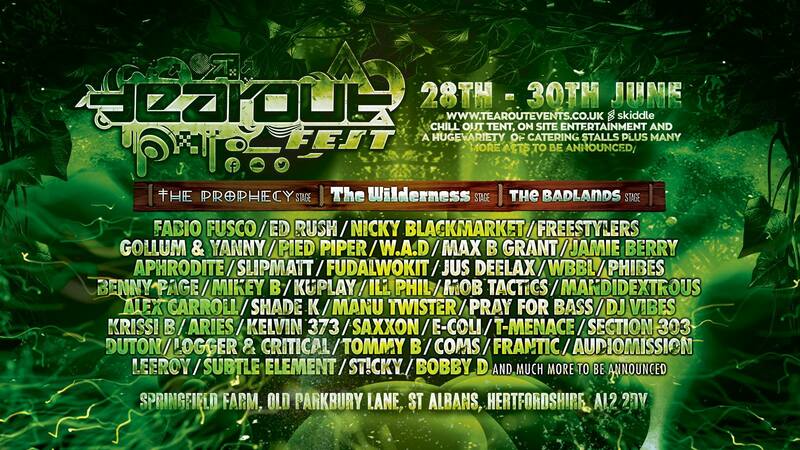 The wilderness has been takenover by some of the finest tribes across England in the underground world. You’ll find these tribes dancing around Revolt Sound System & Concept Lasers to repetitive jungle beats, There will be a huge variety of Jungle, Drum and Bass and Tekno, with artists coming from far and wide to get you lost in the dance. The Badlands stage is a wasteland where many dare not to enter, a scrapyard of what once was. If you risk going there you’ll find the brand new Tearout Audio & Lighting sound system that consists of 12 Super bass horns and 6 Custom Stable Audio KMTS, If you managed to hear it at our 2nd Birthday, you’ll know the system sounds lovely so there will be no disappointed. The Badlands will be providing you some of the finest broken beats around consisting of Breakbeat, Garage, Bassline, Old Skool, House and more. They’ll be a huge variety of food for you to top your energy with. We’ll also have Vegan and Vegetarian stalls to help make sure all dietary requirements are catered for.